There are few things I love more than a great graphic tee or muscle tank, my closet is FILLED with them! A few weeks ago I discovered this brand, Weekend Society, and fell in love. IN LOVE guys, seriously. I browsed their site until my vision went blurry, I wanted everything. I finally landed on this adorable tank top because I loved the message; wander eternal. Did you notice how hard I am cheesing up there in one of those pictures? Oh my goodness, ha! I was leaning on the side of this building and did not notice there was a man inside the building sitting like 2 inches away from my face. It caught me very off guard and we had a good laugh about it, haha. The picture was taken like right at the tail end of my laughing fit but there were a few before I chose to trash because they were horribly embarrassing. I do not have one of those cute candid laughing faces, that’s fo’ damn sure. ANYWAY! This shirt. I am in love. It’s super soft which I wasn’t expecting but am very pleased about, and the length is perfect for me. But with all the said my absolute favorite thing is the graphic on the front. The skeleton with a suitcase and text that reads “wander eternal” ….ummm LOVE! It’s fun and positive and reminds me a lot of my favorite quote; “not all who wander are lost.” I had a ring with that inscribed on it once… which ironically enough, I lost. womp womp. I’m wearing my favorite boots again. I have become a boot-a-holic recently! I’m not mad at it, though, especially when they are as badass as these beauties. Two other things I’m really into right now: 1. sleeveless flannels, and 2: layering necklaces. 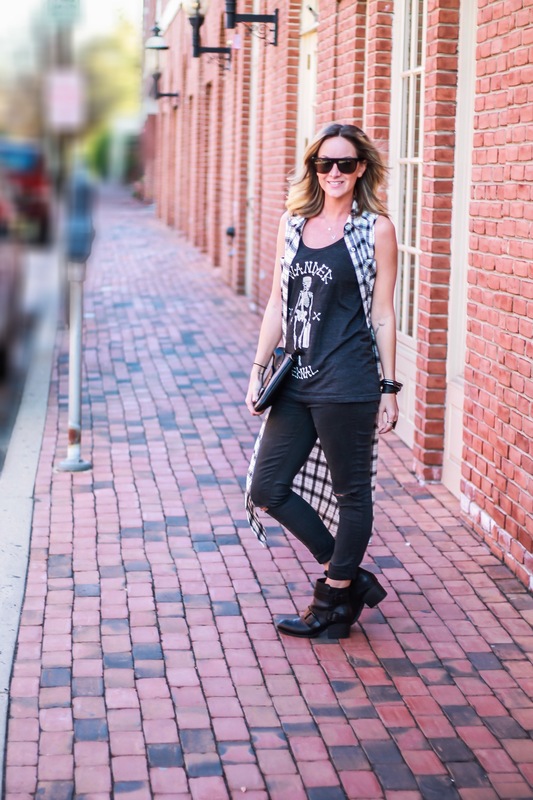 Sleeveless flannels are so fun because you can wear them with soooo many things! I have a shorter one that I basically wear as a skirt layered under a big sweater or like this, open and layered over other pieces. I won’t be able to wear anything sleeveless much longer so I’m getting them all in while I can. And these necklaces, I adore when people make things easier for you! These necklaces were packaged together made to be worn together. It takes away all of the stress of finding different necklaces at appropriate lengths for layering, so I’m a big fan! I love this sleeveless flannel!